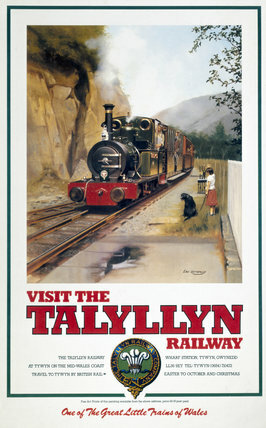 Poster produced for the Talyllyn Railway (TR) to promote their train services in an idyllic setting. Illustrated with train leaving the station, and girl with dog on platform. Artwork by Eric Bottomley. Dimensions: 1010mm x 630mm. Copyright: Talyllyn Railway.